We see quirky and sometimes odd pool tables while out and about doing pool table service in Southern California. But every once in a while we come across one that makes us do a double take. 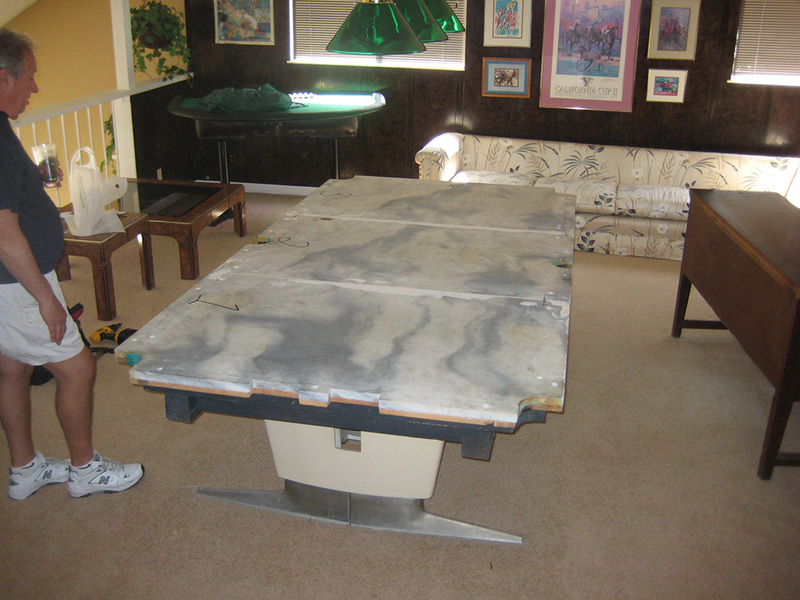 Take this interesting Mitchum pool table in Walnut, California. The frame style is highly unusual with narrow bottomed pedestal legs and ledges on the apron sides. Most pool tables have slate tops, but this one has real marble. There are just a handful of pool tables that have marble tops. Super retro, super cool. And, it will look awesome with the new burgundy felt going on next week when we go back to finish the second leg of the new flooring move. Stay tuned for another before and after feature. I have one of these and would like to know what it would be worth. I an trying to sell it. It’s worth as much as someone is willing to pay for an interesting and unique pool table such as this one. Good luck, DK.